The Salton Sea was so named in 1905, but its history begins in the Salton Basin of ancient times – a time removed some 10,000 years. The present-day Salton Sea is a body of water that currently occupies the Salton Basin, but it is certainly not the first to do so. 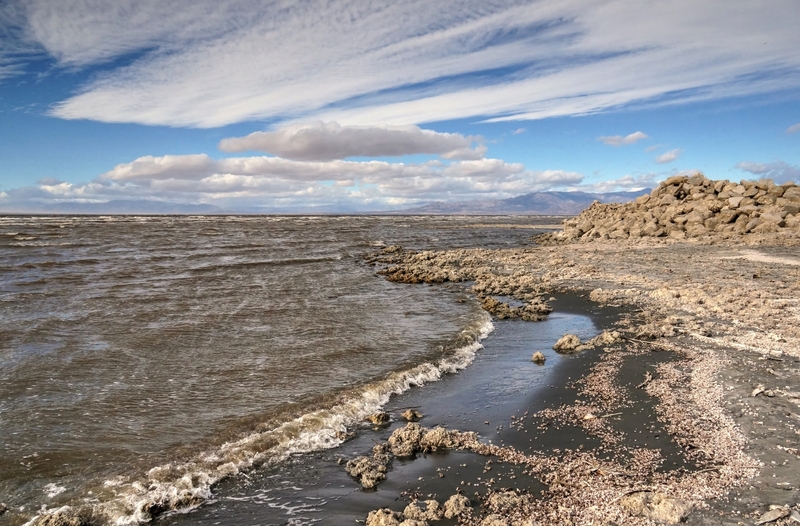 Historic evidence and geologic studies have shown that the Colorado River has spilled over into the Salton Basin on numerous occasions over the millennia, creating intermittent lakes. The first lake to arise was Lake Cahuilla in 700 A.D., which formed when the Colorado River silted up its normal egress to the Gulf of California and swung northward through two overflow channels. Evidence of an ancient shoreline suggests that Lake Cahuilla occupied the basin until about 300 years ago. From 1824 to 1904, Colorado River flows flooded the Salton Basin no fewer than eight times. For example, an 1840 flood created a salt lake three quarters of a mile long and a half a mile wide and, in June 1891, another outpouring of Colorado River water created a lake 30 miles long, 10 miles wide. It is uncertain as to how many times water has filled the Basin over the centuries but human intervention is responsible for inundating the basin only once. In 1901, the California Development Company, seeking to realize the Imperial Valley’s potential for unlimited agricultural productivity, dug irrigation canals from the Colorado River. Heavy silt loads, however, inhibited the flow and new residents of the valley became worried. This prompted the engineers to create a cut in the western bank of the Colorado to allow more water to reach the valley. Unfortunately, heavy flood waters broke through the engineered canal and nearly all the river’s flow rushed into the valley. By the time the breach was closed, the present-day Salton Sea was formed. Instead of evaporating over a period of years, today’s Salton Sea is maintained, in large part, by agricultural runoff from irrigation in the Imperial and Coachella valleys. Irrigation of these fertile valleys supports the Salton Sea and an industry that helps feed the world. Agricultural fields in the region join with the Salton Sea to support an ecosystem that attracts hundreds of species of birds and other wildlife. It is a crucial link in the Pacific Flyway, and a very important part of the Colorado River’s delta. Like its predecessor, Lake Cahuilla, the Sea has been subjected to the whims of nature over the course of its existence. And, its continued existence relies, in part, on dispelling myths and rectifying misperceptions. Today, the Sea, like the Colorado River that gave it life, is on a meandering course into its future. 10,000 BC (approx. ): Native Americans first occupy the Salton Basin. 700 AD: Lake Cahuilla arises in the Salton Sink when the Colorado River silts up its normal egress to the Gulf of California and swings northward through two overflow channels. Lake is subjected to wet and dry climatic cycles over intervening years, filling up and drying out four times. 700 AD: Riverine tribes along present day eastern Imperial County border practice farming. Presence of lake is an attractive addition to their annual round of domestic economics. After planting seeds and kernels in the Colorado floodplain, they cross the Imperial dunes to exploit the lakeshore and return home for summer harvest. 1500 (about): A large inflow of water from the gulf fills the lake to a body of water 26 times the size of the current Salton Sea. Its former water line is still visible on the nearby mountains. 1540: Colorado River delta first explored by Spanish. Melchior Diaz journeys up the mouth of a river now known as the Colorado from the gulf and sends expeditions from the river to present day Imperial Valley. 1604: Don Juan de Ornate, Spanish Governor of New Mexico, explores the river that he names the “Colorado”. 1700-1750: Last large infilling of Lake Cahuilla occurs. 1774: Don Juan Bautista de Anza leads the first large European party through what is now the Imperial Valley on the way to missions of San Gabriel. Salton Sink is a dry lake bed again. 1774: Spanish make first contact with the Cahuilla people, ancestors of present day Torres Martinez Desert Cahuilla Indians. There are 6,000 members of the tribe. About 1825: Trappers, including Kit Carson, Jedediah Smith and Wm. Wolfskill, make trips to the lower Colorado and the Salton Sink. 1840: Colorado River flooding recorded to the Salton Sink. New River possibly formed at this time. 1849: Oliver M. Wozencraft records a flood by the Colorado River into the Salton Sink. 1849: ‘49ers begin crossing Imperial Valley on their way to California gold fields, crossing the mountains via Carriso Creek and Warner’s Hot Springs. 1852: More Colorado River flooding recorded to the Salton Sink. 1853: Imperial Valley recognized as potential desert “garden spot” if it can be adequately irrigated. 1859: More Colorado River flooding recorded to the Salton Sink. 1867: More Colorado River flooding recorded to the Salton Sink. 1876: U.S. Government establishes Torres Martinez Desert Cahuilla Indian Reservation with a grant of 640 acres. 1891: More Colorado River flooding recorded to the Salton Sink, forming 100,000-acre lake. Explorers discover mouth of Alamo River and connection between the sea and the Colorado River. 1891: 20,000 acres of land on the northern side of the Salton Sink are withdrawn from public use for the Torres Martinez Band of Desert Cahuilla Indians. 1892: New Liverpool Salt Company mining salt from a salt marsh centered west of the railroad in the Salton Sink. 1901: Imperial Canal brings water from the Colorado River to the Imperial Valley. 1904: Silt blocks the Imperial Canal preventing it from supplying water to the Imperial Valley. 1905: Temporary diversion of the Colorado River, constructed to replace water from the blocked canal, is breached by floodwaters. River changes course and flows into Salton Sink. 1906: Floodwaters continue to fill Salton Sea, washing away a chain of lakes along the route and threatening Imperial Valley’s fledgling agriculture industry. 1906: George Wharton James explores the flooded areas and reports seeing large concentrations of waterfowl, pelicans and other birds in the Salton Sea area. 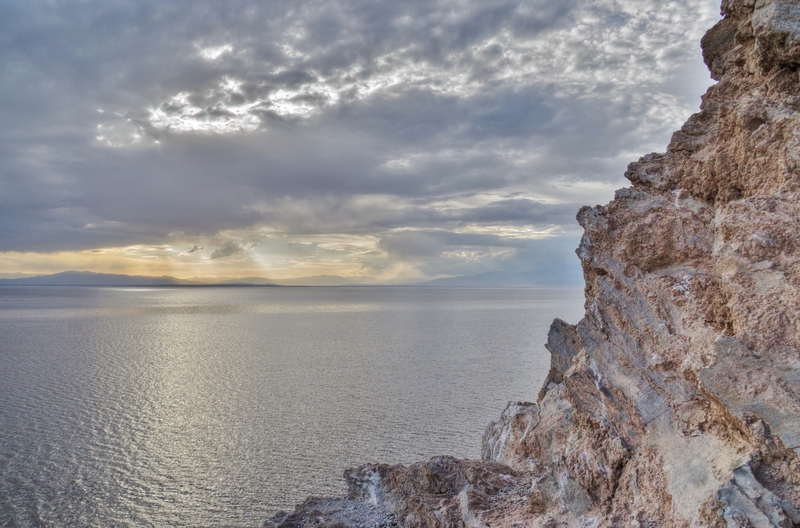 1906: The Salton Sea is recorded at -195 feet below sea level. 1907: Floodwaters continue to fill Salton Sea until in February Southern Pacific Railroad closes the river breach. 1907: Sport fishing first promoted at Salton Sea. 1908: Joseph Grinnell surveys the refilled lake and finds breeding colonies of cormorants, white pelicans and other birds. 1909: Thinking the Salton Sea would be gone by the 1920s, the U.S. Government reserves in trust an additional 10,000 acres of land under the sea for the benefit of the Torres Martinez Band. 1910: Harold Bell Wright chronicles the floods and efforts to close the break in his best-selling novel, The Winning of Barbara Worth. 1911: Imperial Irrigation District formed; discussions begin promoting a new canal to supply water to the Valley. 1917-18 (about): Netting of mullet becomes profitable industry at Salton Sea during World War I. 1924: President Coolidge issues an executive order setting aside lands under the Salton Sea as a permanent drainage reservoir. 1928: Congress authorizes construction of Boulder Dam and the All American Canal that will result in control of the Colorado and elimination of flooding. 1930: Salton Sea Wildlife Refuge established for protection of ducks, geese and shore birds. 1934: Construction begins on the All American Canal. 1935: Salton Sea’s level measured at -248 feet below sea level. 1938: Construction of Coachella Canal begins. 1941-45: Commercial fishermen use Salton Sea to supply mullet to coastal fish markets after German submarines make ocean fishing hazardous. 1942: The All American Canal begins supplying water to Imperial Valley. 1944-45: B-29s from the U.S. Army’s 393rd Heavy Bombardment Squadron, commanded by Lt. Col. Paul Tibbets, make regular but highly secret practice flights from Wendover Air Base in Utah and drop dummies of a new bomb into the Salton Sea. On Aug. 6, 1945, Tibbets and his crew in the Enola Gay drop the first Atomic Bomb over Hiroshima, Japan. 1948: The Coachella branch of the canal begins carrying water to Coachella Valley. 1950: Orange mouth corvina becomes the first salt water game fish to be successfully established in the Salton Sea. Short fin corvina and gulf croacker are also successfully transplanted. 1951: 65 sargo introduced to the Salton Sea – they quickly multiply and become the most abundant fish caught in Salton Sea until their numbers begin declining presumably due to salinity. 1955: Salton Sea State Park dedicated; at the time the second largest state park in California. 1956: Salton Sea’s level measured at -234.5 feet below sea level. 1958: M. Penn Phillips Co., a subsidiary of Holly Corp., maps out a community on the West Shore of Salton Sea, calling it Salton City. 1960: North Shore Beach and Yacht Club Estates opened on North side of Sea. 1961: The California Department of Fish and Game predicts the Salton Sea will eventually die because of increasing salinity levels by 1980 or 1990. 1968: Salton Sea’s surface elevation recorded at -233 feet below sea level. 1968: Tracey Henderson, in her book “Imperial Valley” writes that the Salton Sea’s “salinity threat is constant and is growing more serious each year.” She notes that by 1972, it may be too late to save the sea. 1974: A plan is discussed to reduce salinity levels with a diking system. 1976: Tropical storm Kathleen sweeps through Imperial Valley, flooding farmland and increasing level of Salton Sea. Above average rainfall for the next seven years, along with increased agricultural runoff and increased flows from Mexico, cause flooding of shoreline resorts. 1979: Salton Sea’s surface elevation recorded at -228 feet below sea level. 1980: Conservation efforts by the Imperial Irrigation District begin to somewhat stabilize the level of the lake, although fluctuations continue. 1986: State issues advisory suggesting adults limit their intake of fish from the Salton Sea due to selenium threats. 1988: Salton Sea Task Force formed. It is the forerunner of the Salton Sea Authority, consisting of representatives from local government agencies. 1993: Salton Sea Authority formed in a joint powers agreement among the counties of Riverside and Imperial as well as the Coachella Valley Water District and the Imperial Irrigation District. 1994: Die-off of eared grebes claims 20,000 birds. 1995: Salinity of the Salton Sea approaches 45 ppt. 1997: Congressman Sonny Bono resolves to champion restoration of the Salton Sea and forms the Congressional Salton Sea Task Force. 1998: The Science subcommittee is organized early in the year to conduct research into environmental issues impacting Salton Sea. Dr. Milt Friend is executive director. 1998: Congressman Bono is killed in skiing accident. Mary Bono, his wife, is elected to Congress and picks up the banner for the Salton Sea. 1998: Congress passes Salton Sea Reclamation Act directing the Secretary of Interior, acting through the Bureau of Reclamation, to prepare a feasibility study on restoration of the Salton Sea and submit it to Congress by January 1, 2000. 1999: In August, 7.6 million tilapia and croakers die from oxygen being depleted due to algae in Salton Sea, yet scientific studies show the Salton Sea may have the most productive fishery in the world. 2000: Salton Sea Authority and Bureau of Reclamation release plans for Salton Sea restoration. 2000: Pilot projects are approved and years of just talking about the problem end. 2000: Several systems, including enhanced evaporation and solar ponds, are tested to determine the best way to reduce salinity. 2000: A wildlife disease program is underway for early detection and response to disease outbreaks as a means for minimizing losses. 2000: The Salton Sea Authority enters into a partnership with the Salton Community Services District by funding a fish cleanup effort on the West Shore. 2000: A pet food manufacturer evaluates Salton Sea tilapia and commercial harvesting of the prolific fish becomes a possibility. 2001: Controlling phosphates is identified as a key component to reducing eutrophic conditions in the Salton Sea. 2002: The Salton Sea Authority passes resolution opposing water transfer projects that would significantly lower the level of the sea. 2002: The Salton Sea Authority approves a contract with the University of Redlands to develop an environmental education curriculum focused on the Salton Sea. 2002: The Salton Sea Authority and Kent SeaTech Corp break ground on an innovative project to remove nutrients from agricultural drain water through the use of a natural process involving high-rate algae ponds and algae-eating fish. 2002: U.S. Filter Corp proposes a restoration plan that will provide water to metropolitan Southern California by turning the Salton Sea into a wide, slightly saline river flowing around a salt-water marsh. 2003: Frustrated by the Interior Department’s failure to produce a Salton Sea feasibility study, The Salton Sea Authority Board votes to jump-start the Salton Sea Restoration efforts by taking the lead in developing a restoration plan. 2003: The Salton Sea Authority contracts with Tetra Tech and URS Corp to conduct sea floor core sampling to determine the feasibility of building dikes in the Salton Sea. 2003: After years of negotiations, Southern California’s water districts sign-off on the Quantification Settlement Agreement. The QSA calls for the transfer of as much as 300,000 acre feet of water from the Imperial Irrigation District to San Diego County Water Authority and Coachella Valley Water District. It also provides approximately $133 million for mitigation projects at the Salton Sea. 2003: Arnold Schwarzenegger replaces Gray Davis as State Governor in a historic recall election. 2003: California Regional Water Quality Control Board, Imperial Irrigation Board and others pass resolutions urging “local control” of Salton Sea restoration efforts. 2004: The Water Supply Reliability and Environmental Improvement Act of 2004 (P.L. 108-361) requires the Secretary of the Interior, in coordination with the State of California and the Salton Sea Authority, to complete a feasibility study on a preferred alternative for Salton Sea restoration. 2006: USGS and Reclamation construct Shallow Saline Habitat Ponds (SHPs) on the southern end of the Salton Sea to evaluate the ecological risk to birds from selenium of a blended water strategy in created saline habitat ponds. 2006: Pacific Institute publishes Hazard: The Future of the Salton Sea with No Restoration Project released May 1, 2006 (Pacific Institute, 2006). 2007: In fulfillment of Water Supply and Reliability and Environmental Improvement Act of 2004, Reclamation releases a summary report titled Restoration of Salton Sea. 2007: State of California finalizes Programmatic Environmental Impact Report on Salton Sea Restoration. 2009: Brown Pelican (Pelecanus occidentalis) is removed from the list of threatened and endangered species. Its range includes the Salton Sea. 2009: IID completes Phase 1 (365 acres) of managed marsh complexes in Niland, CA (QSA mitigation). 2010: USGS and Reclamation SHPs at the southern end of the Salton Sea are decommissioned. USGS publishes “An Ecological Risk Assessment” documenting that SHPs are a viable alternative for restoration of wetlands at the Salton Sea (Case III, H.L. et al. 2013). 2011: The U.S. Army Corps of Engineers (USACOE) and the State of California release the Draft EIR/EIS for the Salton Sea Species Conservation Habitat Project (SCH). 2012: State of California’s Financial Assistance Program awards $1,194,154.00 to FWS to fund a portion of the Red Hill Bay Project (south end of the Salton Sea within the Sonny Bono Salton Sea National Wildlife Refuge), which will create 420 acres of shallow saline habitat for migratory birds; $692,819.00 to IID/Sephton to fund a portion of the Salton Sea Water Habitat Pilot Project on the south end of the Salton Sea; and $1,113,027.00 to Torres Martinez Tribe/SSA to fund a portion of the Tribe’s wetlands rehabilitation project, on the north end of the Salton Sea. 2013: AB – 71 (Perez) becomes law and directs the Salton Sea Authority to work in cooperation with the California Natural Resources Agency to ensure the beneficial uses of the Salton Sea. 2013: The University of California, Irvine (UCI), commences The Salton Sea Initiative (Initiative). The purpose of the Initiative is to harness the research, teaching, and service resources of the UCI campus to help address the multiple sustainability challenges faced by the Salton Sea region. 2014: IID completes Phase 2 (approximately 396 acres) of managed marsh complexes in Niland, CA. 2014: DOI and SSA enter into a Memorandum of Understanding on February 27, 2014, to facilitate collaboration and exchange of technical and scientific information regarding the resources of the Salton Sea. 2014: Genetics analyses prove that the endangered bird formerly known as Yuma Clapper Rail (Rallus longirostris yumanensis) is a subspecies of the newly designated Ridgway’s Rail (Rallus obsoletus yumanensis), also classified as endangered. 2014: USGS convenes meetings for stakeholders, scientists, and managers to review all the Salton Sea science conducted to date to assess knowledge gaps, and make recommendations for immediate and near future science and monitoring needs, including anticipated funding requirements for Salton Sea management decisions. 2014: Pacific Institute publishes Hazard’s Toll: The Costs of Inaction at the Salton Sea released on September 3, 2014 (Pacific Institute, 2014). 2015: The California State Water Resources Control Board convenes a workshop on March 18, 2015, in Sacramento California regarding the status of the Salton Sea and revised Water Rights Order 2002-0013, in response to a petition from IID in November 2014. 2015: The Little Hoover Commission (LHC) holds a public hearing on April 28, 2015, at the University of California Riverside Palm Desert Campus, to review the State of California’s Salton Sea environmental mitigation and restoration governance strategy. (LHC conducted a subsequent hearing on June 25, 2015, in Sacramento). Their report was published on September 24, 2015. 2015: The IID Salton Sea Restoration and Renewable Energy Initiative (SSRREI) kick-off meeting is held on January 16, 2015 in Imperial, CA. The initiative is a collaborative incremental restoration approach designed to minimize environmental and air quality impacts, while using revenue generated by renewable energy projects to fund larger scale environmental mitigation and restoration efforts at the Sea. The SSRREI was released in July 2015. 2015: Reclamation records the salinity of the Salton Sea during the quarterly May sampling at approximately 57 ppt. 2015: The State of California announces Bruce Wilcox as the new Assistant Secretary for Salton Sea Policy for the Natural Resources Agency on September 2, 2015. 2015: Pacific Institute publishes the Salton Sea Export-Import Infographic/video at http://pacinst.org/publication/salton-sea-importexport-plans/ on September 29, 2015. 2015: November 5 groundbreaking event for FWS-IID Red Hill Bay wading bird habitat/dust suppression project. 2015: November-December: State of California convenes series of Salton Sea Management Plan agency stakeholder workshops.